A detailed description is too much for this short blog. I’d like to whet your appetite for this scrumptious Rome meal of tourist attractions with a few appetizers. Before we dig into the feast of Rome, both past and present, the traveler should beware that there is far more to see and do than a week or perhaps even a month could properly cover. In order not to exhaust yourself and perhaps consume too much grand culture at once, prepare yourself to visit Rome more than once in your lifetime. Also, the website at the bottom can help you plan your trip. To whet your appetite, we’ll leave ancient Rome for one of the main courses. The first appetizer is located in the center of the city, at the base of the Capitoline Hill, one of the seven hills of Rome. Piazza Venezia is a terrific place to start your tourist extravaganza. This plaza is where several well know streets (Via) connect, including the Via del Fori Imperiali, which borders the famous ancient Roman ruins and leads to the Colosseum. In Piazza Venezia is the Palazzo Venezia, a palace constructed for Cardinal Pietro Barbo who later became Pope Paul II in 1445. Built in the renaissance style of the city by Leon Battista Alberti. The building now houses a museum of culture, containing medieval and renaissance works of art. Rich tapestries, paintings, sculptures, a armor make the visit a delectable one. Next to Palazzo Venezia is the Basilica of San Marcos which had to be reconstructed in Renaissance style because the 4th Century B.C. structure had deteriorated. Inside are works of Giovanni and beautiful 9th century mosaics of Christ Jesus, the Apostles, and some disciples. A myriad of other artwork provides a unique view into the past. 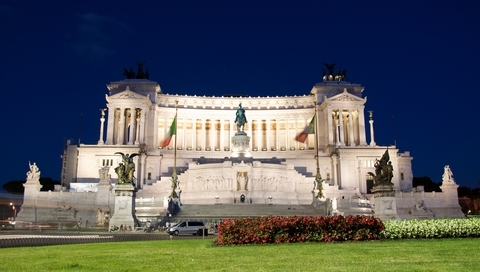 A gorgeous white building, forty years in the making, is a huge monument to Italy’s first king, Vittorio Emanuele II. This monumental masterpiece is in the background of the Piazza Venezia and marks the military rigors and values that forged the nation of Italy. Contained in the monument is the Altar of the Nation that houses the Tomb of the Unknown Soldier, constantly under guard. With all it’s columns, porticos, huge stairways, and enormous statues and fountains, this is an attraction you should not miss. Next month, a second appetizer, the Capitoline Hill, which contains some work of Michelangelo, will be the subject of our Exciting Travel Destinations blog.